Tsutomu Ohshima is the founder and Shihan (Chief Instructor) of Shotokan Karate of America (SKA), and is also recognized as chief instructor of many other international Shotokan organizations. 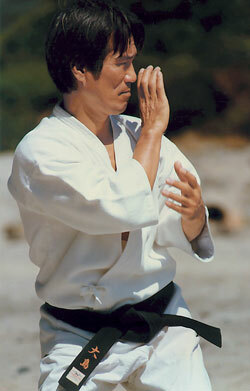 Mr. Ohshima's branch of the Shotokan world has become known as Shotokan Ohshima Karate. Mr. Ohshima was born on August 6, 1930, and by the age of five had already entered the disciplined and rigorous world of Japanese martial arts. Practicing daily, he pursued sumo wrestling from the age of five until he was fifteen; kendo (Japanese sword fighting) from the ages of eight to fifteen, and judo from the ages of nine to thirteen. Mr. Ohshima left Japan in 1955 to continue his studies at the University of Southern California in Los Angeles, where, in January 1956, he led his first U.S. practice. The first university karate club in the United States was founded by Mr. Ohshima, at the California Institute of Technology in Pasadena, CA, in 1957. In 1959 the Southern California Karate Association (SCKA) was founded, and for the next ten years the reputation and membership of the SCKA continued to grow. Many new dojos were started by Mr. Ohshima's black belt instructors in California and across the nation. Thus the organization was renamed Shotokan Karate of America in 1969. © 2019 Shotokan Karate of America. All rights reserved.